Comestible | But first, what do we mean when we talk about Sustainability? But first, what do we mean when we talk about Sustainability? It is often argued that the big “S” word is a buzzword these days, and it is. No matter where you look, it is noticeable how this world is acquiring a special interest, especially lately. The problem often is, sure, most people have started using it but we are not too sure how many people actually understand what it means. From my own personal experience, every time I tell people that my specialization is in Sustainable Design, I get very similar reactions that can be summed up as: A: a blank face of intrigue and confusion, and B: being asked whether that has to do with building eco-houses. I am certain that many people around the globe in very similar situations, experience a similar response. But why is this so? Generally, I would say there are two main reasons why people seem confused about what sustainability means, and then in addition, what Sustainable Design even means. Humanity has the ability to make development sustainable to ensure that it meets the needs of the present without compromising the ability of future generations to meet their own needs. – Our Common Future, 1987. The concept of sustainable development does imply limits – not absolute limits but limitations imposed by the present state of technology and social organization on environmental resources and by the ability of the biosphere to absorb the effects of human activities. – Our Common Future, 1987. Within the need for economic growth and development, limits need to be acknowledged: technological, environmental, and societal. Meeting essential needs requires not only a new era of economic growth for nations in which the majority are poor, but an assurance that those poor get their fair share of the resources required to sustain that growth. –– Our Common Future, 1987. An enforcement of the idea of economic growth to eradicate poverty but striving for a fair distribution of wealth and resources. Sustainable global development requires that those who are more affluent adopt life-styles within the planet’s ecological means – in their use of energy, for example. – Our Common Future, 1987. Within an acceptance of an unequal use of resources and the planetary boundaries, changes are required on the side of the richer economies to suit their allowed global quota. Because of this vision being the most prominent understanding of Sustainability, since then, the concept has always been influenced by ideas of necessary economic growth and development. However, as stated before, not all ideas acknowledged in this vast document are discussed and shared equally. Interestingly, this is not the first time that the concept appears on the headlines. Dresner2, in his book covering the fundamental development of Sustainability states that it was initially introduced as a title in the 1970s with the publication of the book The Sustainable Society led by the World Council of Churches – again, after the famous Stockholm Conference. Here, he argues, it is the anthropologist Margaret Mead, the one to influence this by coining the slogan “A just, participatory and sustainable society”. This is a very relevant detail not to miss within discussions about Sustainability. The approach from this perspective is not economic-influenced by fundamentally social. When seen from this perspective, the problem of -unsustainability- is predominantly human, caused and suffered because of human limitations and capabilities, and necessarily needed to be dealt that way. What I am trying to say here is what has already been stressed lately by the international organizations, especially within our latest 2015 Sustainable Development Goals3, social and environmental crises are inherently connected. An environmental focus only, would miss to represent and fails to understand the real complexity of the problem, almost missing the point completely, that Sustainability is only a human conundrum. This leads us directly into discussing the many ways in which Sustainability is understood nowadays. We have already covered how these ideas originated. After a few decades of slow progress, a few key models and approaches were introduced. Without attempting to cover the whole spectrum, i will focus on the most influential ideas that we encounter today. To simplify the discussion I will start by mentioning the work done by John Elkington4 and his very popular Triple Bottom Line framework for Sustainability. 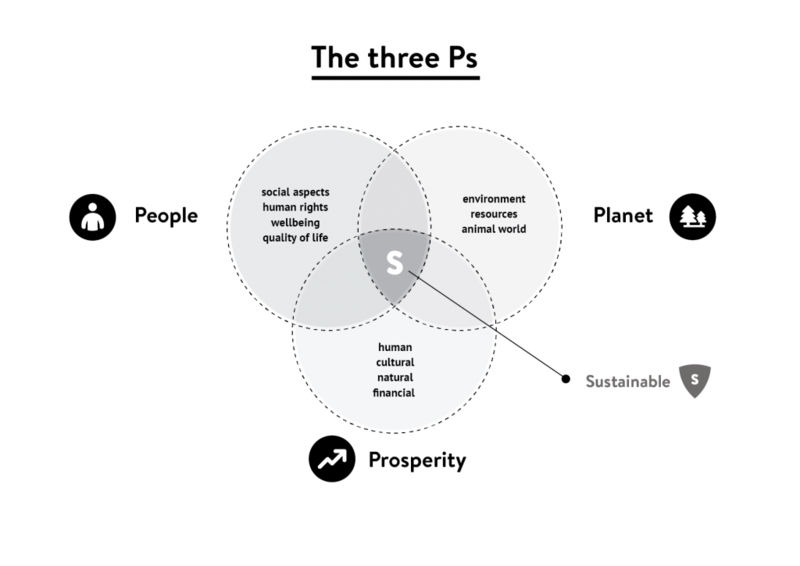 The reason for introducing this model first, is because it has influenced the development of the ideas upon which Sustainability mostly relies upon, i s very straightforward and simple way, the famous Venn diagram of three circles: social, environmental and economic. This has then influenced similar models that you can find under the names of The Three Ps, the Three E’s, the Three Ethics of Permaculture, to even a Quadruple Bottom Line, and so on. What is important to understand from this models is that they require some degree of mutual balance or equilibrium within these 3 very broadly defined areas. One has to look into every single model to understand the smaller and bigger differences that reflect different worldviews and disciplinary backgrounds. To simplify the argument and in the interest of a clearer communication, I have encapsulated the main ideas that relate to each one of these three pillars or categories in the following graphic. I have personally opted to use the Three P model as the base, and decided to call for Prosperity as opposed to Profit (which is sometimes used to define the economic side). This term goes beyond a direct reference to our current Economic predominant system to offer a broader and more neutral view. The reason why this clarification is important is that Elkington’s original model is related to Economics, hence his using the Bottom Line terms and his attempt to relate this other areas with this concept. This model has been widely criticised but still, it offers the most dominant understanding of Sustainability today. Elkington himself acknowledged that the nature of this model often fails to consider issues related to social justice. McKenzie5, was one of its main critics. The view of the latter is mostly focused around social issues, and he has been one of the main contributors to the discussion about Social Sustainability being mostly neglected. As we have seen, the initial model was mostly concerned about the Economic side. McKenzie argues that most of the work and discussions begin strongly rooted around environmental concerns which is true given the historical development. In many cases, the discussions are focused around matters of conservation of the natural ecosystems, or around managing natural resources efficiently, reducing pollution, etc., which is coherent with the economic lense in the sense that many times, these problems and their effects area easily quantified. However, McKenzie strongly argues the need to develop the notions around the Social aspects, detaching this view from environmental and economic concerns only. His view is at odds with the most prominent focus until this day, where more importance and funds are placed within research in the natural sciences and towards technological solutions, neglecting the larger and more complex socio cultural underpinnings upon which these solutions will rest. As we have seen, different people opt to stress some aspect of perspective on how to understand Sustainability or which direction to work towards. There are a myriad of views which I encourage you to explore, but ultimately, I think it is important to understand that these three or four or “x” number of pieces are necessarily interconnected. What is also clear from what we have discussed so far is that the most prominent focus of Sustainability tends to be an interest in the conservation of the natural environment, or what some people say, an ecological view. Because this interest has been gaining ground over time due to the increasing environmental problems arising everywhere, it is understood that this is a major concern, however, it is not wise to mistake Sustainability for Ecology. They are very distinct terms and their focus, although somewhat related, is quite different (Please refer to the Glossary for their definitions). This confusion coupled with its popularity, has led to the current confusions, and to people thinking or Eco-Anything when the big S world comes up. To sum it up, Sustainability is different and larger than ecology, it is not only concerned about ecosystems of living creatures, plants, communities and their interactions, it is not only the natural world that it is focused on. It is also concerned about the fluxes and changes happening within the societies and cultures that inhabit this planet, and all the systems, networks and structures upon which they have been built. Sustainability is mostly about people, and how to cohabit a finite yet changing system that we call Planet Earth without endangering our own survival on it. If you are still wondering, Sustainable Design is then, a lot more than Eco-design, and there is a lot more to do than build houses that are friendlier with the environment. The directions in which we can look at are almost endless. 2 Dresner, S. (2008) The principles of sustainability. 2nd edn. London: Earthscan Publications. 5 McKenzie, S. (2004) ‘Social sustainability: towards some definitions’, Hawke Research Institute Working Paper Series, (27).